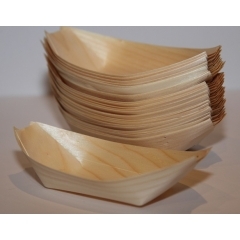 Disposable Bamboo Boats 140mm. x 75mm. x 50pce. Home > Homeware > Disposable Bamboo Boats 140mm. x 75mm. x 50pce. Great for nibbles or Hors d'oeuvre. Note these are 140mm. x 75mm. Comes in lots of 50.